This year, the great city of Seattle, Washington is the location of both the International Trademark Association Annual Meeting (May 19-23) and the American Intellectual Property Law Association Spring Meeting (May 15-17). If you are one of the many lawyers attending these events and you want a Seattle trademark experience, you could do the obvious and visit locations associated with the city’s famous modern brands. Alternatively, you could go back in time a bit further. Washington became the 42nd state in 1889, the same year the Great Seattle Fire destroyed much of the city. A combination of new railroad lines and post-fire construction led to a boom in population and commercial activity. On July 17, 1897, this already-promising economic climate went into hyper-drive when the S.S. Portland arrived from Alaska, heralding the beginning of the Klondike gold rush. The trademark disputes that arose from this economic activity started working their way into the published opinions of the Ninth Circuit and the newly christened Washington Supreme Court in the first decades of the twentieth century. We took a look at the first ten trademark disputes involving the city of Seattle (which date from the turn of the century up to the start of World War I). To our delight, we found them riddled with connections to celebrities, shootouts, world politics and the multicultural fabric of migration in the American west. So, if you need something to do in Seattle, why not review our ten part Seattle Trademark History series. You can even create your own Seattle Trademark History Tour by consulting our handy map (also reprinted at the end of this post) and visiting one of the locations that gave rise to these disputes. This is Part 2. You can find the other nine parts of the series (once they are published) by clicking here. Restaurateur Chauncey Wright was a Seattle legend in his own time. He had moved to Seattle from Los Angeles as a boy in the 1880’s, headed up to the Klondike for the gold rush, where he sold coffee and sandwiches to prospectors, and then returned to Seattle in 1900 to open a series of restaurants. But at least one person didn’t think Chauncey Wright was such a great guy: his former business partner, Charles Gearheart. 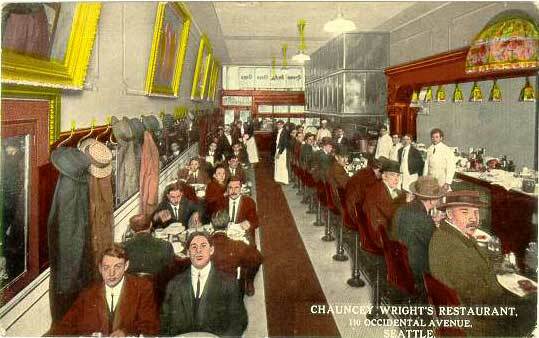 In 1909, the popular Chauncey Wright Café was located at 164 Washington Street (now the Fuel sports bar). The establishment was owned by the Wright Restaurant Company” of which Wright and Gearheart each owned 50%. But Wright had big plans to expand. In 1910, he sold his half of the Wright Restaurant Company to Gearhart and opened up a new restaurant (the one at 110 Occidental Avenue). The new restaurant was a modernist marvel: open twenty-four hours; “lightning” fast service, refrigeration units and breakfast all day. The sign on the new restaurant read: “Chauncey Wright, President, Seattle Restaurant Company.” The words “Chauncey Wright” were in great big text, and the rest was printed in smaller font underneath. A man may not so use any name, not even his own name, as unfairly to compete with another person or corporation by confusing in the public mind his business with that of the competitor. By the Court’s reckoning, Wright’s new sign “could hardly have been adopted for any other purpose” than to create such confusion, and therefore dismissal of the unfair competition claim was inappropriate. The lower court was reversed and the matter remanded for trial. But Wright had the last laugh. On remand, he won the trial. He testified that the transfer of shares to Gearheart had been made with the express provision that Gearheart was to stop using the CHAUNCEY WRIGHT trade name. The Court believed him, and held that it was Gearhart who had to change his sign. Gearhart appealed, but the Washington Supreme Court affirmed in Wright Restaurant Co. v. Wright, 74 Wash. 230 (Wash. March 28, 1912). Wright went on to own several other restaurants, including a tea room on the top floor of the Smith Tower, which was the tallest building west of the Mississippi River when it opened in 1914. However, Wright became ill and died in 1917. His widow, Annie Wright, carried on the business for a time, even opening a new location in the iconic Colman Building in 1919. Annie had a great idea for this new restaurant: make the tables slightly shorter to accommodate the fastest growing consumer subset: women. Despite her innovations, by 1926 the Chauncey Wright restaurant empire was no more. Special thanks to the following excellent sources, all of which were consulted for this blog series: Gary Flynn’s Brewerygems.com; Historylink.org, a free online encyclopedia of Washington state history; Blackpast.org, an online reference guide to African American History; librarian Alan Michelson’s Pacific Coast Architecture Database; the University of Washington library digital collection; the Orbis Cascade Alliance’s Archive West; Lost Restaurants of Seattle by Chuck Flood; the Pacific Shellfish Institute website; Historian Rob Ketcherside’s ba-kground blog; the Capitol Hill Seattle Blog; the DorpatSharrardLomont blog Seattle Now & Then Series; the Seattle Times; the Seattle Department of Neighborhoods website; and Seattle-Tacoma radio station KNKX.